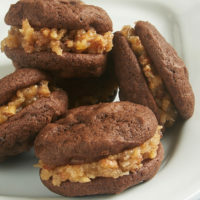 Chocolate pairs with so many things… peanut butter, coffee, caramel. But it also pairs pretty darn well with more chocolate. 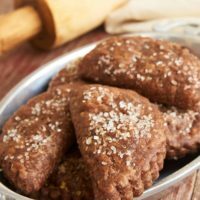 If you’re thinking that I make a good point, then keep reading as I introduce you to these Chocolate Hand Pies. To begin this story, I first must turn back the clock a bit to when I was writing 5 Ingredient Baking. 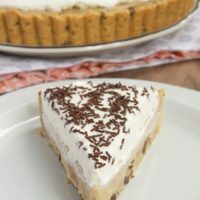 I desperately wanted to make a version of my grandmother’s chocolate pie to include in the book. I gave it a few tries, but I ultimately had to abandon it. Deadlines will make you do those kinds of things, you know. I never could quite get the filling to work as I wanted. But, the crust? The crust was magical. 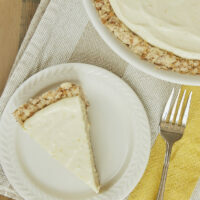 It was my go-to pie crust recipe with one minor alteration. I added cocoa powder to make a chocolate pie crust. And it was amazing. I have to confess that I had pushed the idea of that pie to the back of my mind. But then recently, I was perusing an issue of Bake from Scratch and saw a recipe for little chocolate pies. 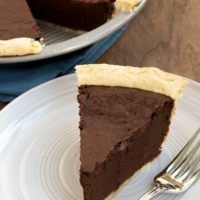 I instantly recalled my chocolate pie crust and knew that I had to make them! 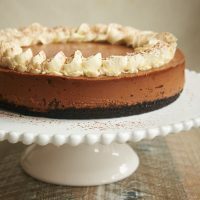 I am happy to tell you that this chocolate pie crust is just as good as I remember. And stuffed inside that crust is a rich, fudgy, 3-ingredient filling made of dark chocolate ganache and Nutella. If you’re thinking that sounds pretty amazing, let me assure you that it is. 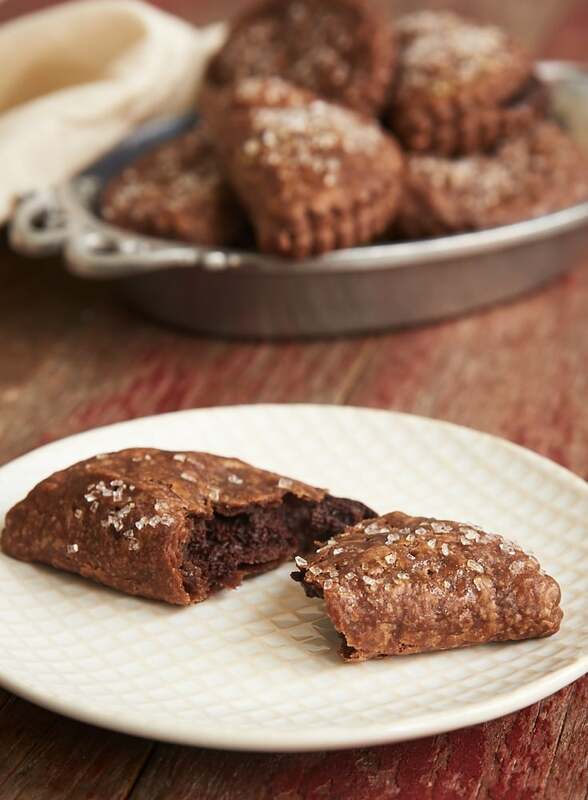 They’re perfectly sweet and fudgy and oh-so-chocolate-y. And if you have the willpower, these little guys are even better the next day. 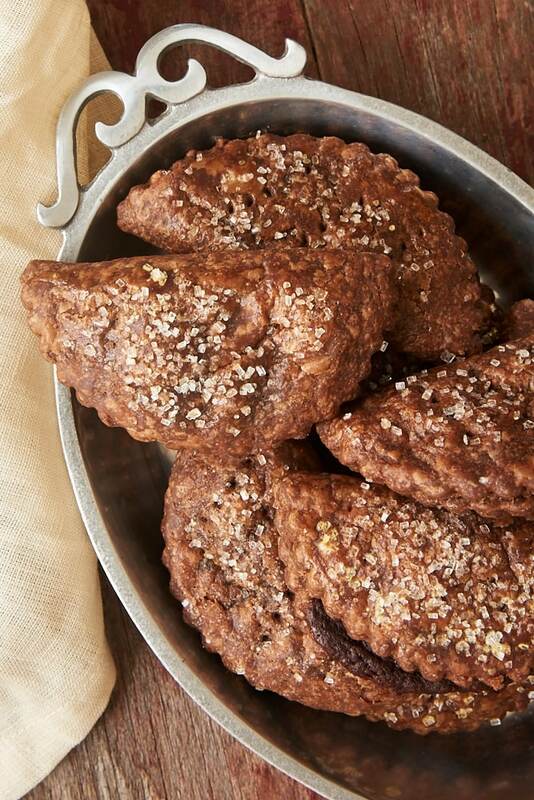 This is the part where I should tell you that these Chocolate Hand Pies are great for sharing. You certainly have that option, but don’t be surprised if you want to keep them all to yourself. 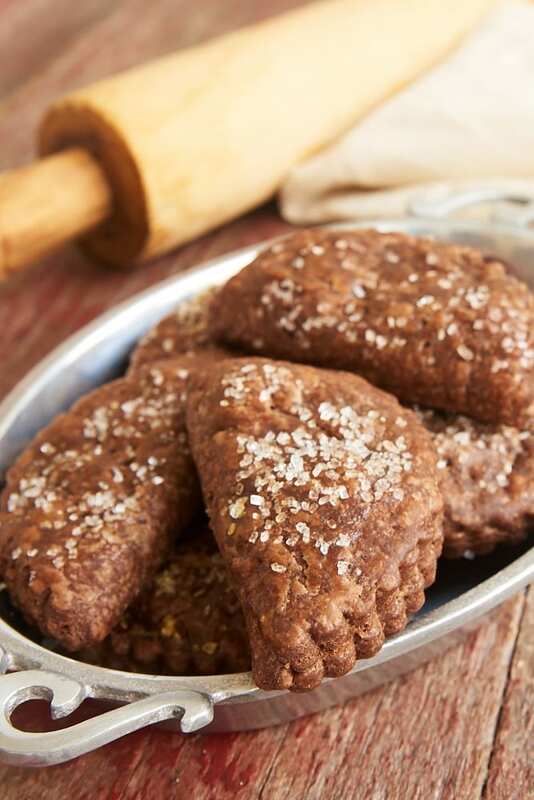 Chocolate lovers will delight in these rich, fudgy Chocolate Hand Pies. 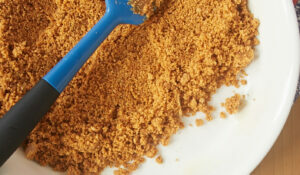 Whisk together the flour, cocoa powder, sugar, and salt in a large bowl. Add the butter and mix with a pastry blender or a fork until the mixture resembles coarse meal and the butter is the size of small peas. Add 2 tablespoons of water and continue mixing. Add more water as needed, 1 tablespoon at a time, until a dough forms. Divide the dough into two equal portions. Wrap each portion tightly in plastic wrap. Refrigerate for at least 2 hours or up to overnight. Place the chopped chocolate in heat-proof bowl. Set aside. Place the cream in a small saucepan. Cook over medium heat until it begins to bubble. Pour the cream over the chocolate. Let it stand for 5 minutes. Then, whisk until smooth. Add the chocolate-hazelnut spread, and whisk to combine. Refrigerate the filling until it is firm (about 45 minutes to an hour). Remove one of the dough portions from the refrigerator. If it chilled overnight, it may need to sit at room temperature for 10 to 15 minutes until slightly softened but still cold. Lightly flour a clean work surface. Roll out the dough into a circle about 1/4-inch thick. Use a 3 & 1/2-inch round cutter to cut out rounds of dough. Gather and re-roll the dough once. Repeat with the other portion of dough. Spread about a tablespoonful of filling on half of the top of each dough round, leaving about a 1/4-inch border around the edge. Be careful not to over-fill, as the pies won’t hold together well during baking. Pierce the other half of the dough round a few times with a fork. Combine the egg and water to make an egg wash. Lightly brush the edges of the dough rounds with a bit of egg wash. Fold the fork-pierced side over the filling side so that the dough round is folded in half. Press the edges to seal. Place the pies on baking sheets lined with parchment paper or silicone liners. Refrigerate for 15 minutes. Remove one pan of pies from the refrigerator. Lightly brush the tops of the pies with egg wash. (You won’t use all of the egg wash.) Sprinkle with sanding sugar. Bake for 20 to 22 minutes, or until the dough appears thoroughly baked. Repeat with the remaining pan(s) of pies. Cool on the pans for 10 minutes. Then transfer the pies to a wire rack to continue cooling. *The yield depends a bit on how efficiently you cut out your dough rounds. The dough that remains after cutting can be re-rolled once, but more than that tends not to work as well. Filling recipe slightly adapted from Bake from Scratch, which also fortunately reminded me of this forgotten pie crust. Jam should be fine. Or just double up on the ganache and omit the Nutella. 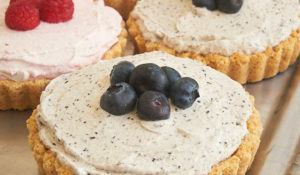 These look beautiful, I have to make them soon. Reminds me of a treat I had as a child. these look fantastically fudgey inside and flaky outside. i like how prim they are! All that chocolate…you KNOW it has to be a good thing! ummm YEAH these sound 1000% AMAZING! choc pie crust and a choc/nutella ganache filling???! PINNING! 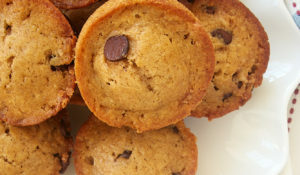 Can these be made ahead and frozen before baking? If so, would you bake directly from the freezer and add extra baking time? Hi, Meghan. It’s possible, but I think they might turn out a bit soggy. If you want to freeze, I’d suggest freezing the pie crust. Let it thaw and then make the filling when you’re ready to assemble and bake. Alternately, you might try freezing the filling separately and then assembling once both components have thawed. How do you recommend storing overnight? You mentioned they’re better the next day- do you put them in plastic tupperware, or just leave them loosely wrapped? 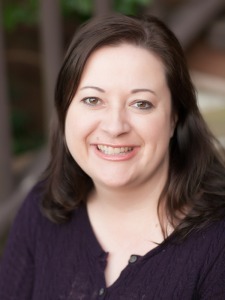 Hi, Christine. I usually store them in an airtight container. Hello! I’m wondering what you could use if you’re not a fan of hazelnut spreads? Or– does the flavor come through enough to make a difference? Thank you so much!! Hi, Georgia. It’s not a bold flavor, but it’s definitely there. There are chocolate spreads without nuts. Check for those alongside the other spreads at your supermarket. 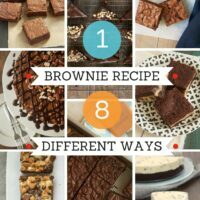 Alternately, you could try peanut butter or another flavor spread.